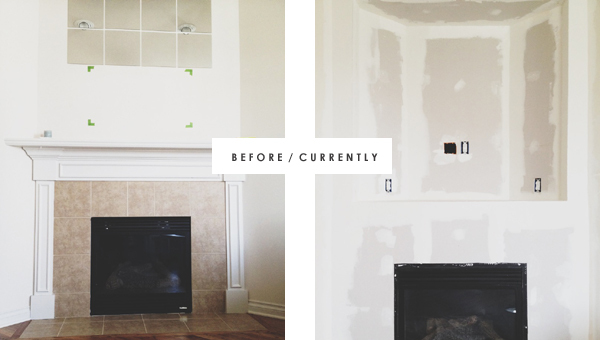 We've made a lot of progress on the fireplace project, but still have a little way to go. So far we've removed the upper wall and mantle/tile around the fireplace, framed out new walls for the built-in, added electrical outlets, and put up drywall. Then came the slowest part: drywall mudding (and mudding some mooore), and sanding. Now we're ready to add shelving to the built-in area, put up trim, and finally...paint. Q is so cute about projects like this. Being an engineer, he'll randomly send me an email during lunch with detailed renderings of the entire project (like the plans above). Meanwhile, I've been overly comparing paint colors, and think I've decided on moonshine for the room walls, and white dove for the shelves and trim. Hoping it will all come together soon! 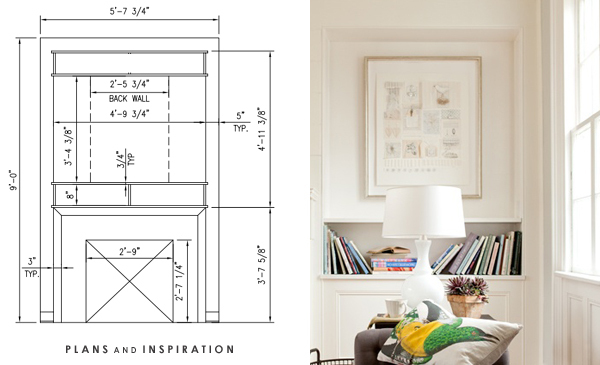 I love that built in area and how he created a schematic for this! I can already tell this will turn out amazing! It will be beautiful! You two are such a great pair for projects like this: an engineer and a designer. Can't wait for the final rendering! Oh, so fun! I can already tell that it will look fantastic! This makes me wish my house had a fireplace,especially with winter heading our way. My husband is an engineer too. Isn't it funny how they just throw themselves into projects like that. So cool! I love those colors, this is going to look amazing. ohhh yes! I'm loving it so far! Can't wait for it to be complete. How exciting! That's adorable about Q's detailed plans. Can't wait to see it all come together!